‘Chengdu Wanda City’ is a large-scale, comprehensive urban development project in which Wanda Group invests 55 billion Yuan (8.2 billion USD) with the goal of “revolving the level of cultural tourism in Chengdu”. 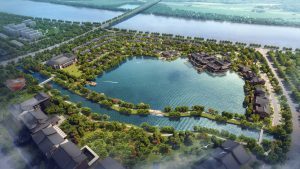 It covers an area of ​​310 hectares with a GFA of ​​5 million square meters. 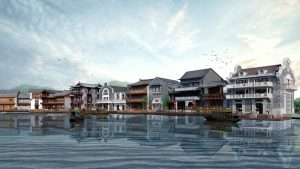 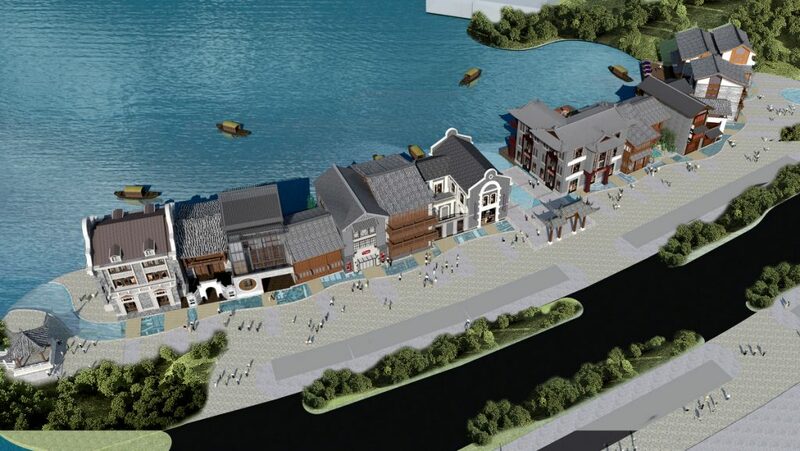 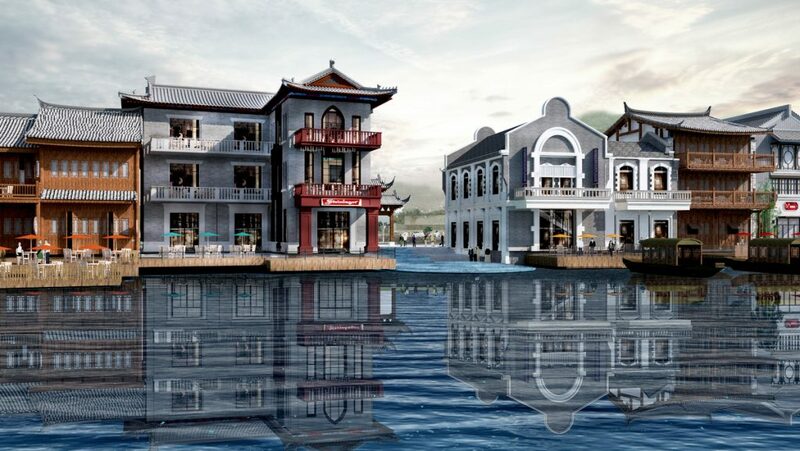 The development is planned to include a Wanda Mall, an outdoor theme park, a stage show house, a hotel group and a bar street by the river. 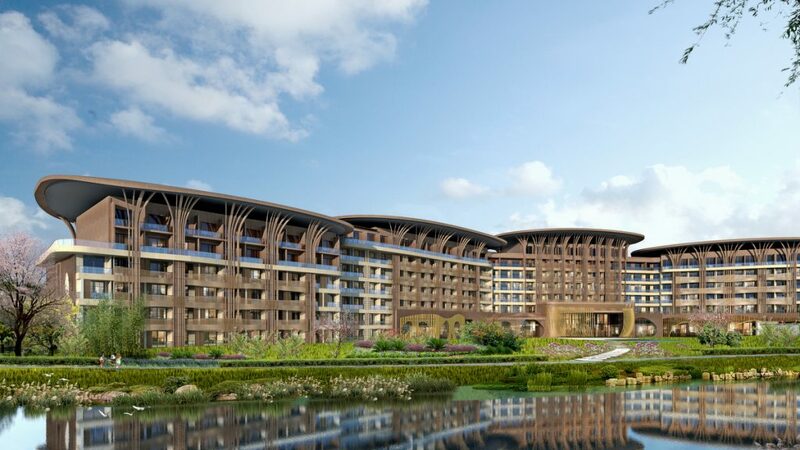 The Hotel Group under the responsibility of Wanda Group consists of a six-star hotel, a five-star hotel, a theme hotel, a conference center and a bar street with a total gross floor area of some 140,000 square meters. 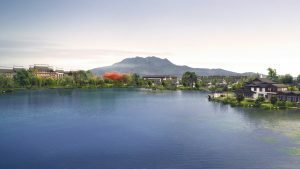 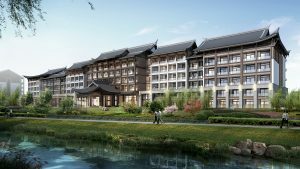 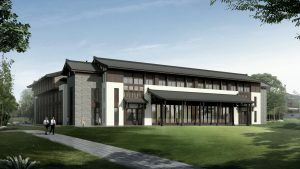 Wanda Group / Chengdu Wanda City Investment Co., Ltd.
Continue reading "Dujiangyan Hotel Complex"
A mere 5 minutes’ drive from the hotel group is Duwen Expressway (S9), the link between Sichuan and Tibet tourist attractions, such as Wolong Nature Reserve, Wenchuan County and Mount Siguniang. The project is the last upscale hotel group on the route to Tibet. 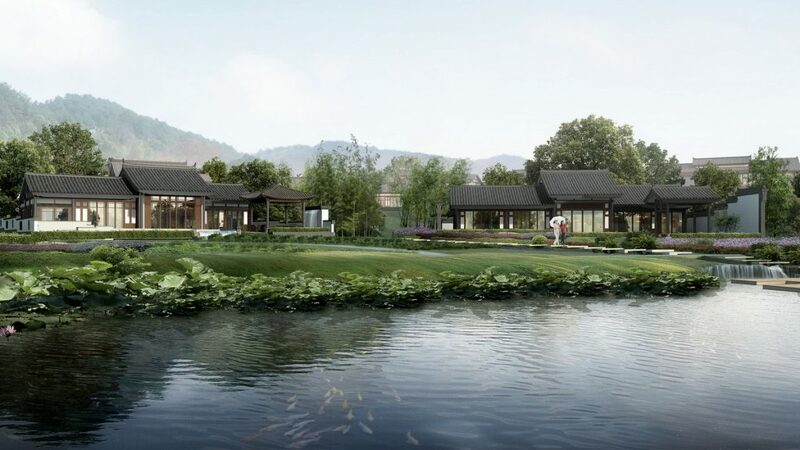 The project is located in the south of Dujiangyan, the famous town of longevity and a well-known tourist destination, especially famous for its over 2,200 years old irrigation system. 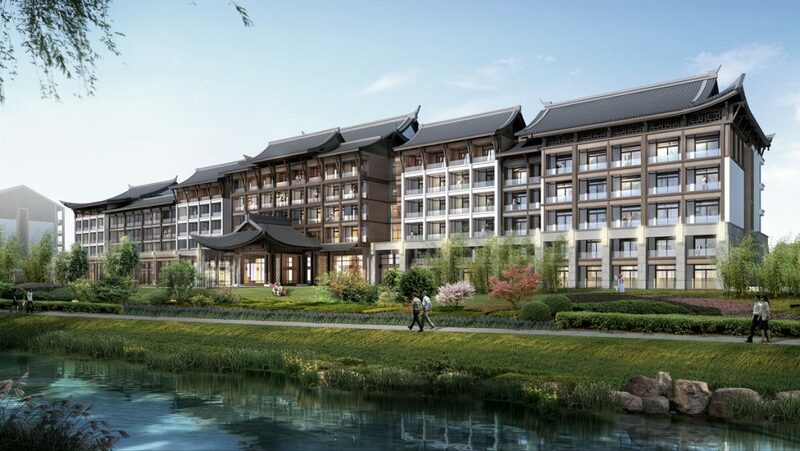 The hotel complex borders the big Min River, the longest tributary of the Yangtze in the east and Zhaogong Mountain in the west. 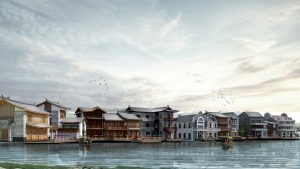 ‘Black Rock River’ in the east of the site divides the site into two blocks from north to south. In addition to these existing water bodies, the Client plans to excavate 7.5 hectares of artificial lakes inside the site to further improve the environmental level. 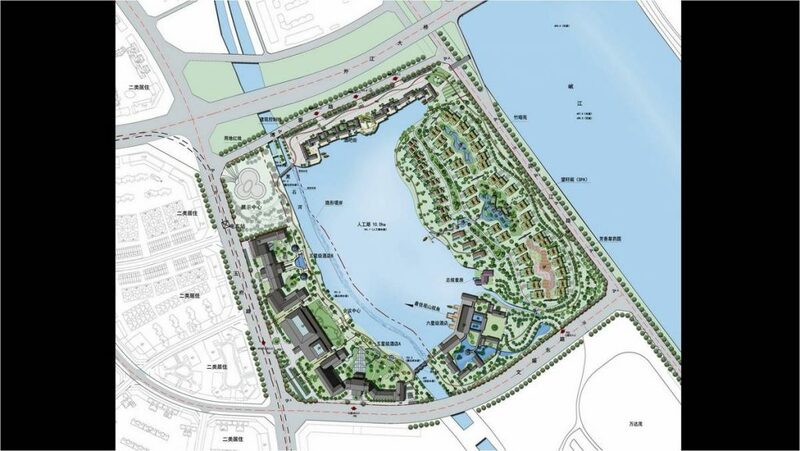 The building blocks of the hotel group are developed along the perimeter of the site with artificial lakes inside. The lobby of the Six Star Hotel is located in the southeastern corner. 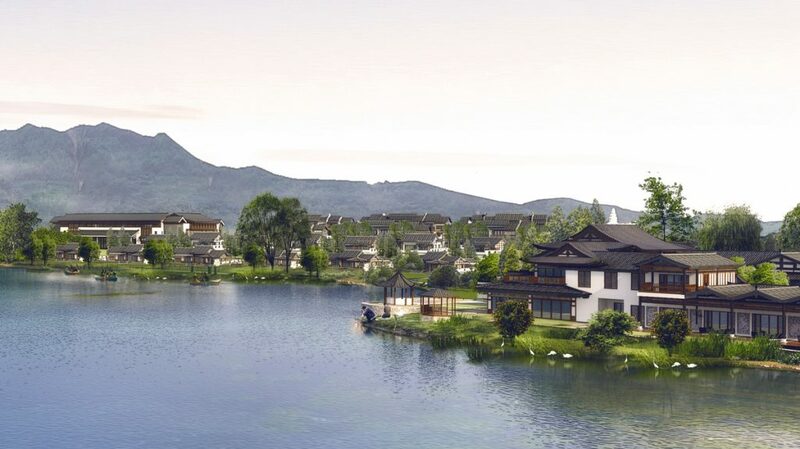 Visitors standing in the lobby can see the lake and overlook the Zhaogong Mountain. 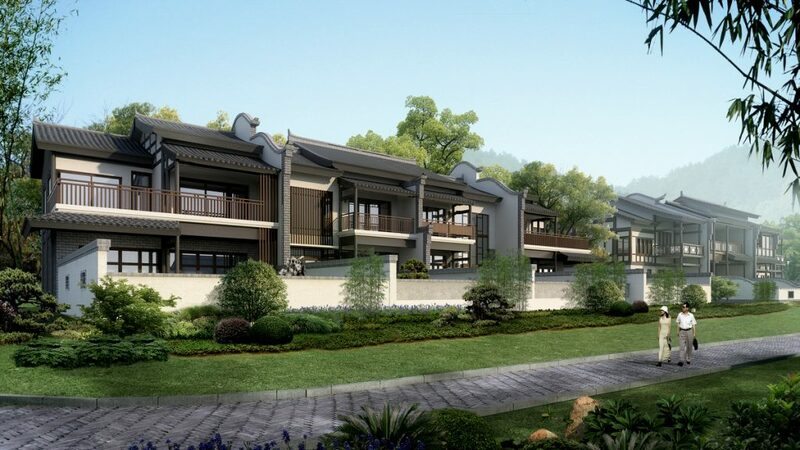 The villas are extended northward. Using the terrain and the lake, all the villas have good views. 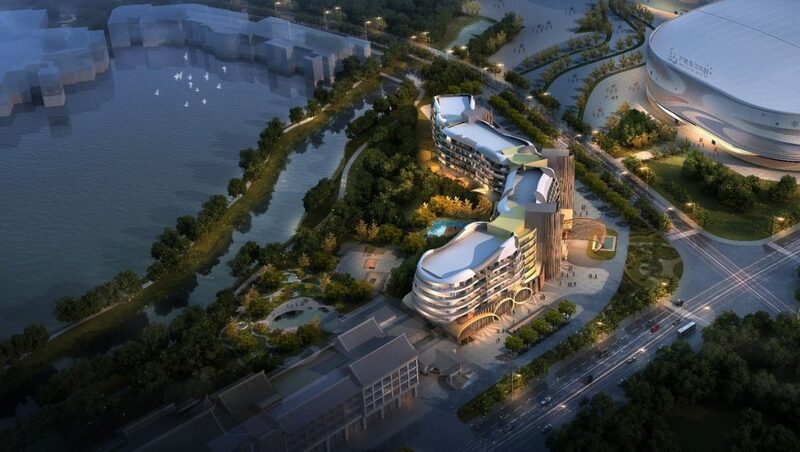 The five-star hotel and theme hotel are located at the southwest corner of the site, using the boundaries of the Black Rock River to enclose their respective interior landscapes. 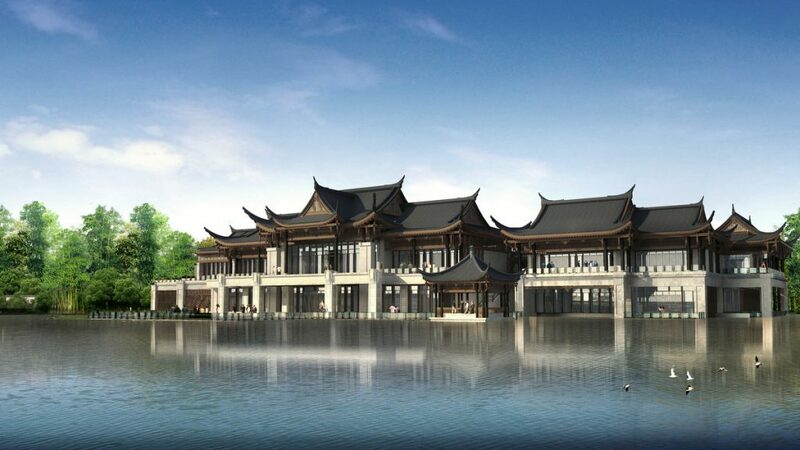 The Six Star Hotel covers an area of about 11 hectares with a total of 90 villas. 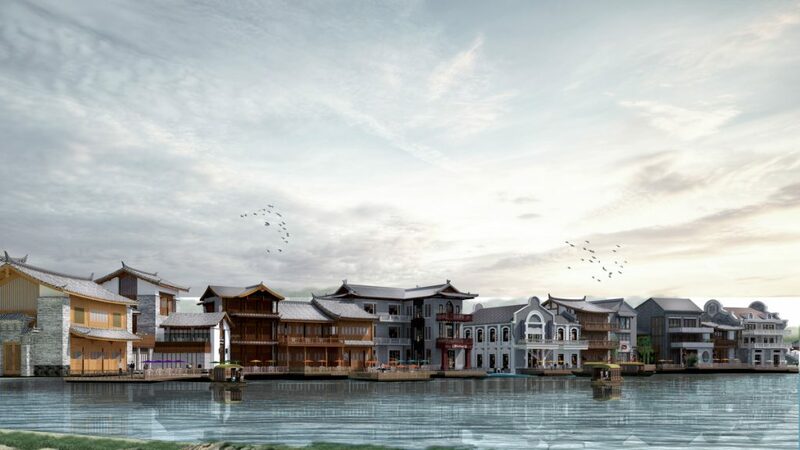 The inspiration for the hotel design is the West Sichuan Palace hidden in a bamboo forest by the river. 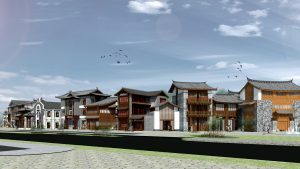 The building materials in western Sichuan are mainly wood, limestone, gray brick and gray tile, presenting a simple texture and natural beauty. Traditional materials and structures have been incorporated into the design of the hotel lobby, and have been changed, reorganized and renewed to the greatest extent, retaining the shape and meaning of the traditional local architecture. Furthermore, we fell back on the skills of gardening in Western Sichuan, and used the methods of “suppressing” and “leaking” to expand the space experience of the guests. 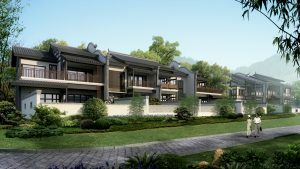 The villas all have outdoor hot springs. Taking advantage of the height difference of the terrain, guests can enjoy the view of the artificial lake or the Minjiang River from the outdoor pool, while ensuring the privacy of the villa. 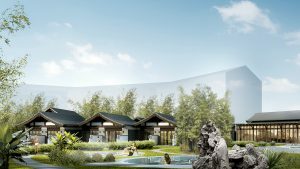 The Spa is located between the five-star hotel and the theme hotel, with a separate external entrance and access from both hotels through a corridor. 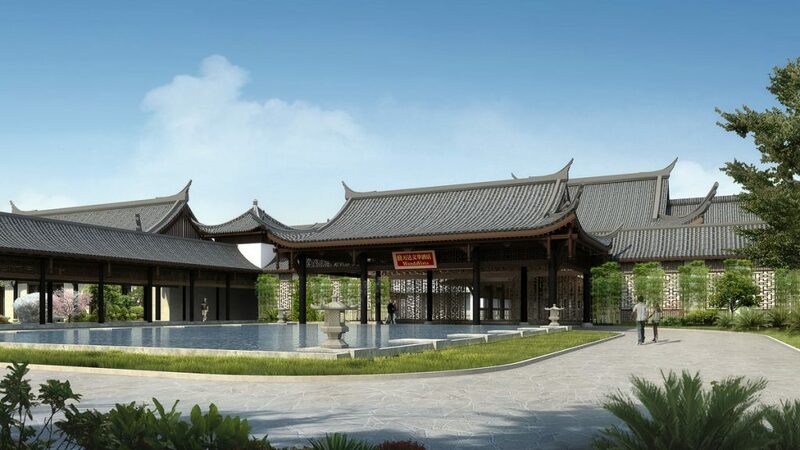 The total area is 1,800 square meters, and it is equipped with 7 outdoor pools of 2,000 square meters. 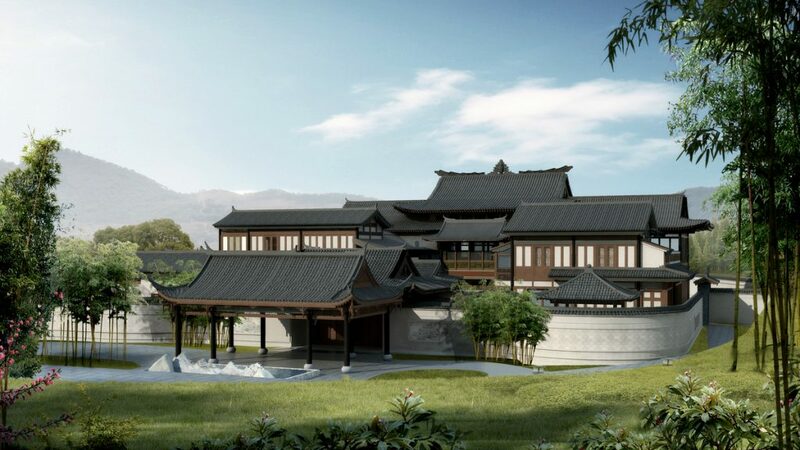 In the façade design, the spa takes reference of the traditional forms and materials of Western Sichuan. 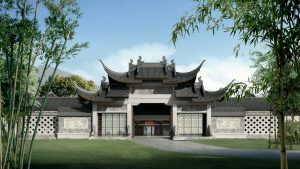 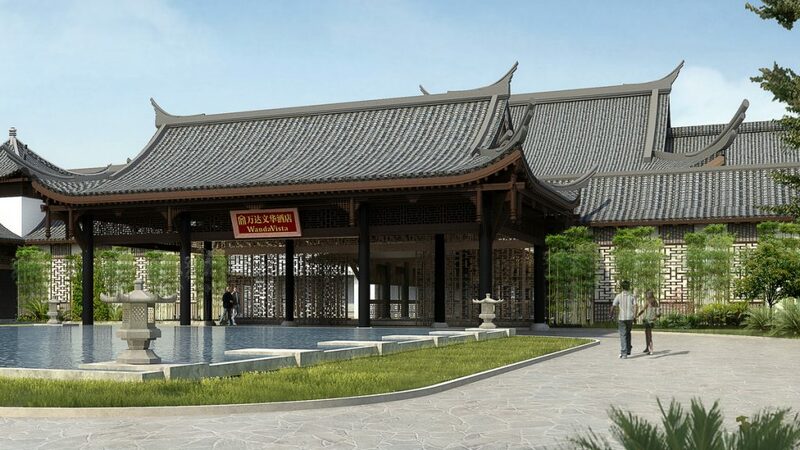 But in order to create a more relaxed atmosphere, more civilian structures have been adopted, such as the “ChuanDou” structure or the “supporting arch”. 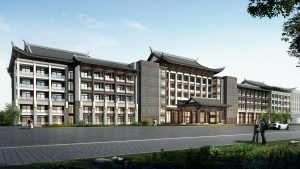 The five star hotel with 300 guestrooms has a privileged situation with its proximity to Heishi River on the East and its location right beside the big lake. 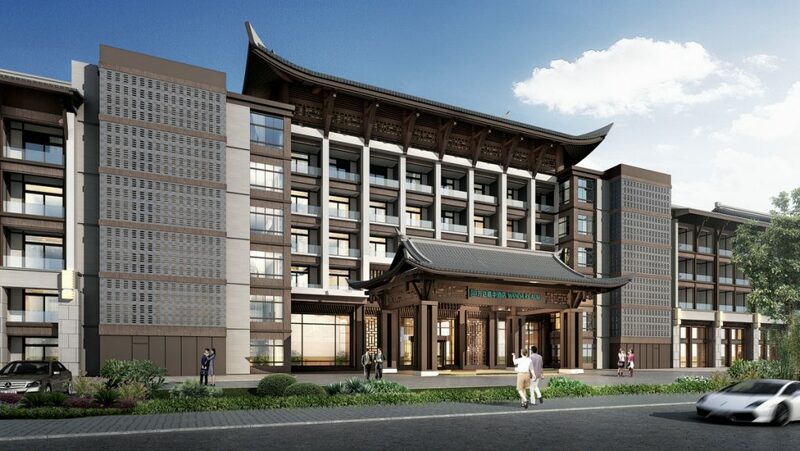 Based on traditional Sichuan architecture (‘Chuanxi’ style), the base of the building – which usually is the noble one, hence accommodates the public functions of the hotel – is clad with stone with carvings that resemble flowing water – as reference to the local culture with its millenniums of history of water management. The main body – where the guest rooms are located – is designed to convey a town-like atmosphere where several buildings are attached to each other with different heights, in order to break the horizontality of the building and create a certain random rhythm. 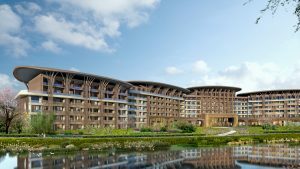 The balconies combine white plaster and wooden details in order to create a local feeling but in a rather modern way. 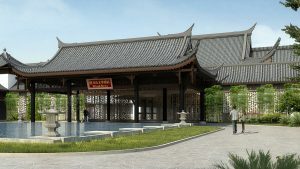 The grey clay-tile roofs seem to be floating from above the building and then hold by the elaborated wooden structure. 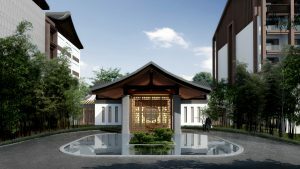 The main entrance of the hotel is emphasized by placing two vast, abstract interpretations of traditional Chinese lanterns on both sides. During the night there will be a special effect created by a perforated brick wall that will cast distinct patterns on the street when lit from behind. The five star hotel is characterized by simple and elegant details. 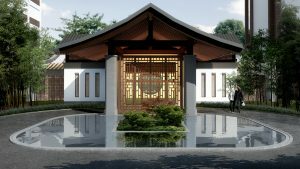 Different combinations of the same materials are used to obtain ‘unity in diversity’, as the key for consistency and excellence. The building is neighbouring the five star hotel on its north side, Heishi River to the east and the huge ‘Wanda Entertainment Park’ on the opposite side of the road, towards south. 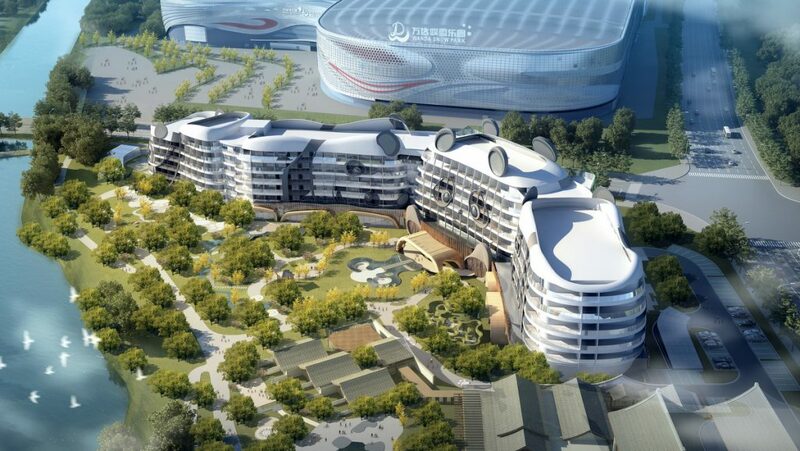 Due to the existence of several panda research and preservation parks in the city of Chengdu (which is only 55 km away), the ‘world of pandas’ was chosen as a theme for the hotel. 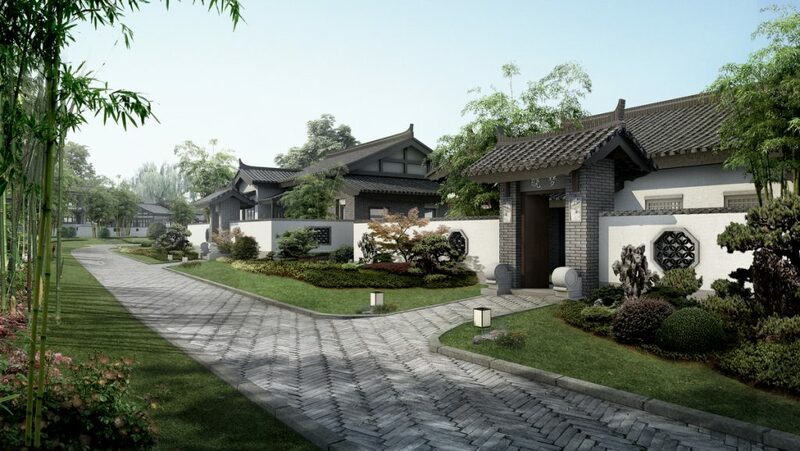 The design approach had families with small children as main target. As common feature with theme hotels, the main goal is to achieve an immediate feeling from the building and façade itself suggesting a certain level of playfulness. Guests will be able to feel the ‘world of pandas’ not only from the elements of the landscape but from the building as well, which stands out as the icon of panda life. 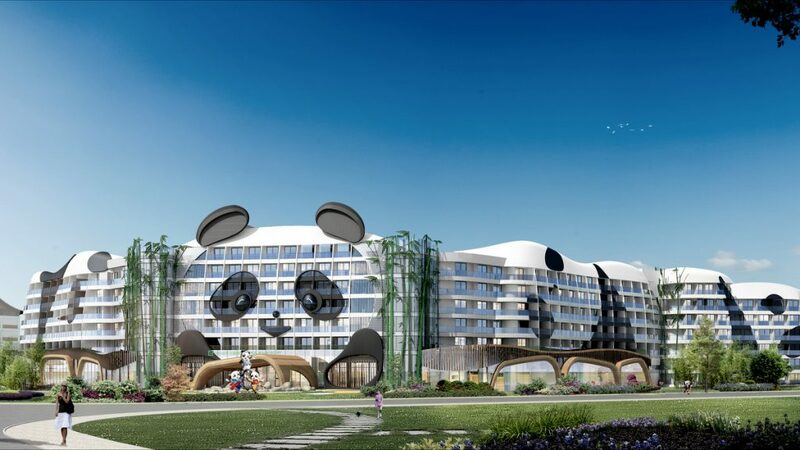 As we approach the hotel from the road, a 6-storey, organic-shaped building features a composition that reminds us of several pandas standing or laying down. 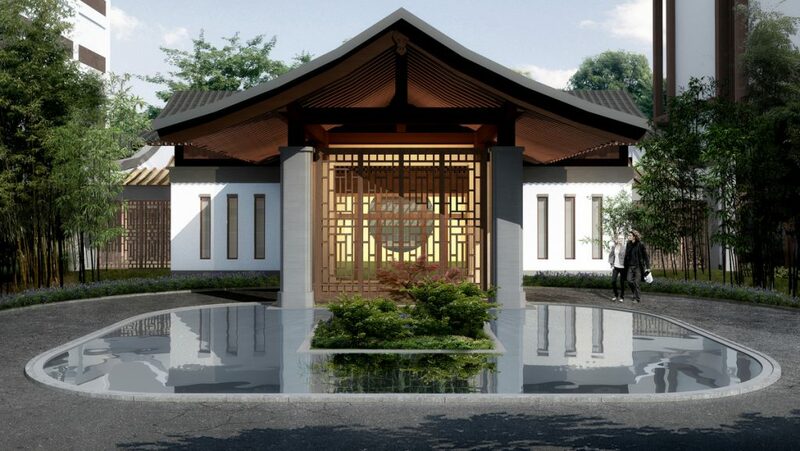 Panda faces and bodies defined by a white background with dark grey spots and shapes, and those hanging from the bamboo base and hiding between the bamboo forests of the vertical cores, give us the feeling of a natural panda habitat welcoming the guests. 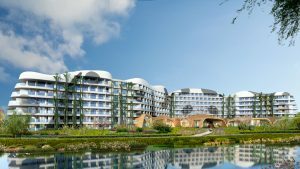 On the ground floor large framed windows step out from the façade to define the main public areas of the Hotel. 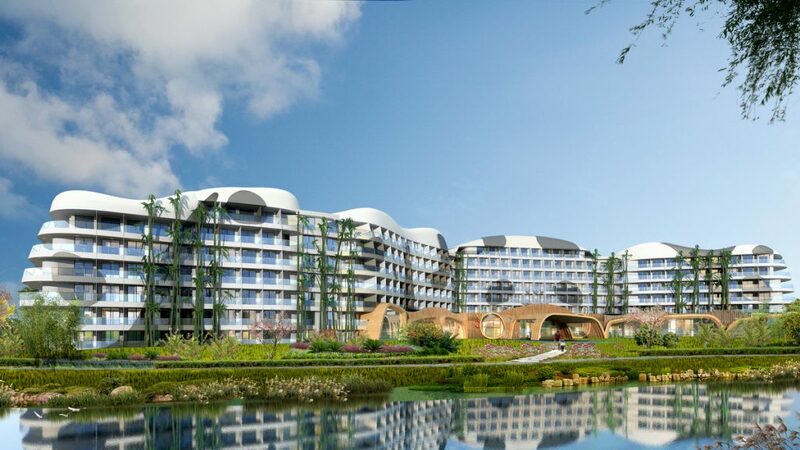 The building has four main parts with an undulating façade that open towards the river and the lake behind in ordered to optimize the views from the guest rooms. 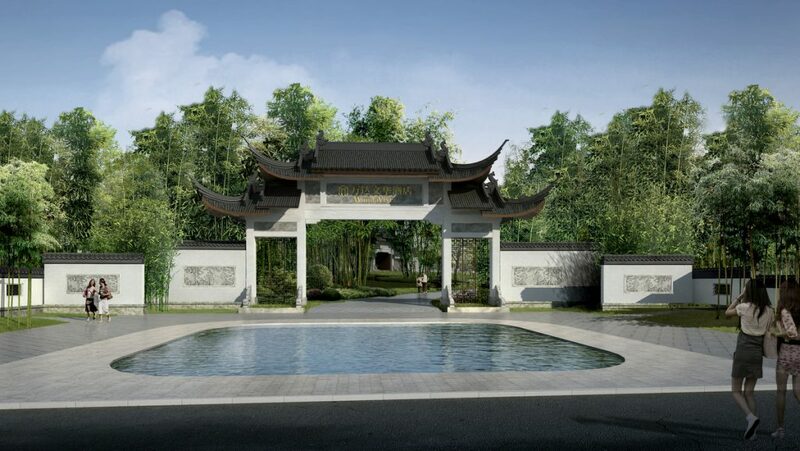 The undulating gesture allows enclosing a garden that gives privacy and distance from the road. 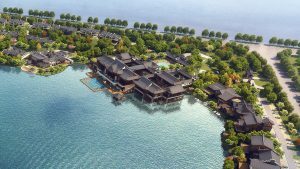 The 461 guestrooms have balconies that project towards the water side or to the mountain side making the hotel special not only for its theme, but also for its splendid views of a great location. 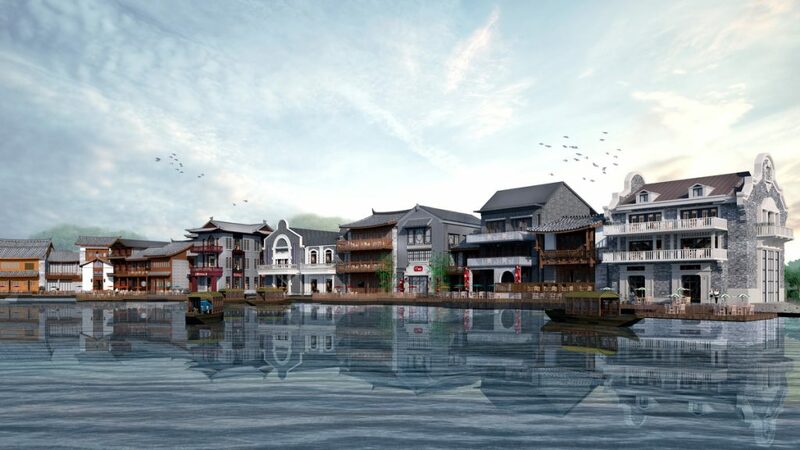 Dujiangyan has not only a long history, but also colourful architectural forms and styles. 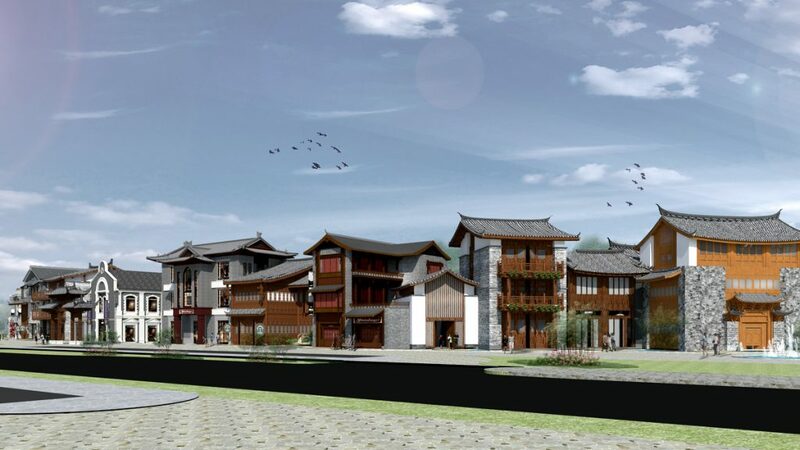 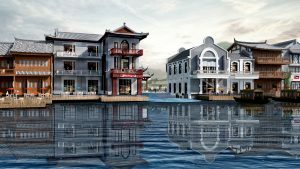 In the design of the ‘Bar Street’, the architectural concept was to blend Chinese and Western traditions and to blend the ancient and the modern: Traditional Sichuan architecture (offering traditional Chinese food or accommodating classical tea houses) is mixed with Republican style (1912-1949) and modern architecture (offering Western food and bars) as well as “new Chinese style” (offering modern Chinese food) in a harmonious way. 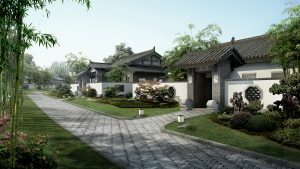 Blending the different styles brings a whole new urban experience. In the landscape design, local traditions have been adapted, myths and legends are combined with landscape elements and with the architectural design, further blurring the boundaries between time and space and function.